Minister of Border Security and Organized Crime Reduction Bill Blair appears as a witness at a standing committee on public safety and national security on Parliament Hill in Ottawa, Sept. 25, 2018. Bill Blair is giving himself until the end of the year to consult Canadians and experts on the need for a handgun ban, saying he wants to stop gang members from getting their hands on firearms that were initially purchased legally. The proposed measure is being vigorously opposed by the Conservative Party of Canada, but a number of Liberal MPs, as well as the city councils of Toronto and Montreal, are calling for a ban in response to recent shootings in Canada. Pressure has been growing on the federal government to enact tougher gun laws after a mass shooting along Toronto’s Danforth Avenue on July 22 and a deadly attack against a mosque in Quebec City last year. Mr. Blair said illegal handguns are either smuggled into Canada from other countries, especially the United States, or “diverted” from legal domestic sources by criminals. He added that any solution proposed by the government will be based on evidence from Canada and around the world. “We will go and get the best available data. I want to be informed by the best [information] we can find,” Mr. Blair said. Conservative MP Glen Motz, a former police officer with the Medicine Hat Police Service, said the federal government is playing politics by contemplating a handgun ban. He said he is particularly concerned that the government will change firearms laws without a guarantee that the measure will reduce crime. Appointed to cabinet in July, Mr. Blair is in charge of a series of complex files, including the legalization of recreational cannabis and the flow of asylum seekers entering the country from the United States. 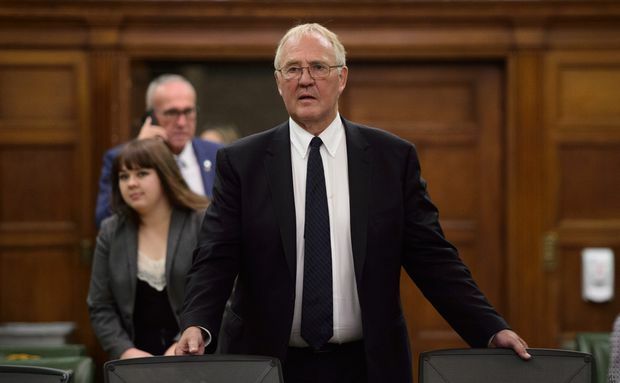 At the meeting of the public safety committee on Tuesday, Conservative MPs tried and failed to get Mr. Blair to state that he wants to put an end to all border crossings at unauthorized points of entry. “My understanding now is that you do not have a mandate to stop people from illegally crossing the border from safe spaces like upstate New York and claiming asylum in Canada,” Tory MP Michelle Rempel said. Mr. Blair responded that his goal is to get all asylum seekers to seek entry at authorized border crossings, but he needs to discuss the matter further with U.S. officials. “My responsibility is to ensure that Canadian law is upheld and Canadian humanitarian principles are adhered to,” he said.